CHICAGO — September year-over-year sales for coin laundry operators were higher, on average, across the country, according to the results of this month’s American Coin-Op StatShot survey. With the country divided into four regions, the South posted the largest gain for the month, 8.7%, when compared to sales for September 2014. 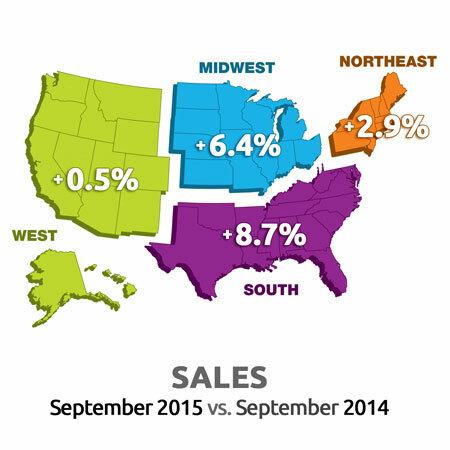 In the Midwest, September 2015 sales were 6.4% higher than those of September 2014. Operators in the Northeast saw their collective sales for the month rise by 2.9% compared to September 2014. Year-over-year sales were relatively flat in the West, up just 0.5% in September compared to September 2014. Third-quarter 2015 sales were also positive for all regions, with the South posting a 10.5% increase from the same period last year. The Northeast (7.3%) and Midwest (6.7%) also reported healthy year-over-year gains for the quarter. In the West, third-quarter sales were 1.2% higher than they were for the same period in 2014. American Coin-Op audience members are invited via e-mail to participate in the surveys, which are conducted online. All self-service laundry owners/operators are encouraged to participate, as a greater number of responses will help to better define industry trends.